Paratus Familia Blog: The Package or the Gift? Miss Calamity is twelve. Twelve is an interesting age for a young lady. Bodies change, outlooks change and priorities change. As Miss Calamity and I sat discussing life's big questions she paused for a moment and said "Mom, my legs spread out when I sit down, are they fat?" I sat, looking at my beautiful daughter, stunned. There is nothing the least bit fat about my daughter. For her to even think that she had a problem concerned me. I took a deep breath, organized my thoughts and spoke into my daughters life. I explained the differences between men and women, and how they store fat. I told her of the necessity for women to store fat in certain areas so that they could provide for a baby when they are expecting. I told her about the perfect way that God designed men's bodies for the work he had for men and women's bodies for the work he had for women. The more Miss Calamity and I talked, the more I realized that, as modern women, our focus is completely out of line. We pay so much attention to the package, that we forget the gift inside. The truth is that I want Miss Calamity to take care of herself physically. I want her be neat and tidy and attractive. I want her to watch her weight and eat healthy food. But I never want that to be the focus of who she is. I want Miss Calamity to cultivate grace and mercy. I want her to be an encourager, a helpmeet and a true friend. I want the gift of who she is to be far more valuable that the package she in which she is wrapped. As we sat discussing our purpose as women, I asked Miss Calamity how she would choose a gift. I described a table overflowing with packages, some plainly wrapped, some beautifully wrapped. 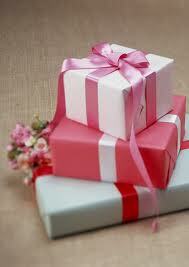 There were gifts with flamboyant paper and ribbons, others with brown craft paper and kitchen string. There were huge gifts and tiny gifts. Tidy gifts and messy gifts. I then asked her which gift she would choose, knowing nothing about them other than their wrapping. She silently contemplated for a moment and said "I think I would have to open them to know which was the best gift". How right she was! The truth is that the fancy, ribbon bedecked package could be full of snakes. The huge present could be empty. The snazzy, tidy little package could be full of socks. And, the plain, little brown-paper wrapped present could contain a priceless diamond. In order to find the real treasure, the true gift, you would have to get past the packaging. You would have to peek under the wrappings to see the contents inside. You would have to search the gifts to know which were worthless...or worse, and which ones were priceless. As women, we need to teach our daughters to be treasures of true worth, not empty packages. We need to cultivate character worthy of daughters of God. I want Miss Calamity to care for her outer-self but I want her outer-self to be but a reflection of the gift that is concealed inside. I want the treasure that she is to be worth far more than the package in which it is contained. Our world is full of misconstrued values. We have an opportunity to teach our children the difference between a pretty package and a gift of consequence. Beautiful post and exactly what I am hoping to teach my girls as well. I struggle with my own self-esteem though so sometimes it can be a challenge but I am working on it!! Wow! How beautiful. Just as your daughter is. I am blessed to have found your site some time ago. You have a wonderful way with words, a gift I am so happy you share. I looked forward to reading your blog all day while I was putting up peas and beans and this post was such a wonderful reward. All your children are beautiful. But more importantly they are far more than their physical looks, they are true gifts of worth from the Almighty. this is the perfect example for me to use with my beautiful, but slightly overweight daughter who sometimes struggles with self esteem. THANK YOU for sharing your life experiences which help the rest of us with ours. I just love your analogies. They are always so beautiful and so illuminating. this was such a beautiful warm anology enola. you are such a talented writer and i love visiting your blog.. Welcome to 12 Miss Calamity! You are such a Blessed young woman to be the offspring of such God fearing, wise and loving parents!